How to Deploy a P.L.A.D. 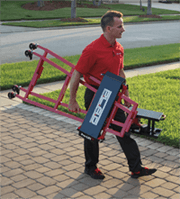 Below is an instructional video on how to properly and safely deploy PLAD's Pro-Lift LX Portable Lift Assist device. For our new customers, please carefully watch the video and call us if you have any questions prior to using your Pro-Lift LX in the field. "It was wonderful, had the person in his wheel chair in no time (400+ pounds). Well on its way to paying for itself in workplace safety cost"
Why pay another Workman's Comp claim from a lift assist injury? © 2019 PLAD, Inc. All Rights Reserved.